for the Transfiguration of our Lord and Savior Jesus Christ. Click on the photo below to open the album. Thank you to Victor Lutes and Mother Capetolina for their beautiful photographs of the Pilgrimage this year. 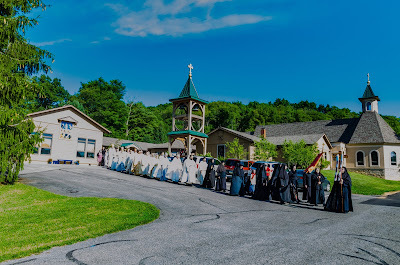 Mother Christophora and the Sisterhood of the Monastery of the Transfiguration, Ellwood City, PA, welcomed hundreds of hierarchs, clergy and faithful from across the United States and Canada to their annual pilgrimage on August 4-6, 2018.
he Sunday Divine Liturgy. Concelebrating were Archpriests Peter Pawlack and Michael Hatrak, Priests Dan Hoarste and John Bunea, and Deacon Peter Ilchuk served. Monday, August 6—the Great Feast of the Transfiguration—opened with the celebration of the Akathistos Hymn “Glory to God for All Things,” after which 40 vested priests were led in procession by the nuns to the outdoor chapel, where the Hierarchical Divine Liturgy was celebrated. After greeting the visiting hierarchs at the monastery’s newly constructed guesthouse, Tabor House, the nuns led them in procession to the chapel, where Mother Abbess Christophora formally welcomed Metropolitan Tikhon.On Sunday evening, His Beatitude, Metropolitan Tikhon, officiated at the festal Vigil. Concelebrating clergy included Archpriests Chad Hatfield and Michael Senyo; Priests Michael Gavrilos and Dan Hoarste; and Archdeacon Joseph Matusiak. In addition to Archbishop Benjamin, His Eminence, Archbishop Nathaniel of Detrot and the Romanian Episcopate; His Eminence, Archbishop Melchisedek of Pittsburgh and Western Pennsylvania; and His Grace, Bishop Paul of Chicago and the Midwest, were in attendance. Responses were sung by the monastery choir under the direction of Mother Seraphima. Following the Vigil, some 100 visiting clergy and pilgrims enjoyed dinner and fellowship. Mother Christophora also spoke of the releationship between Archbishop Nathaniel and the monastery’s foundress, Mother Alexandra. 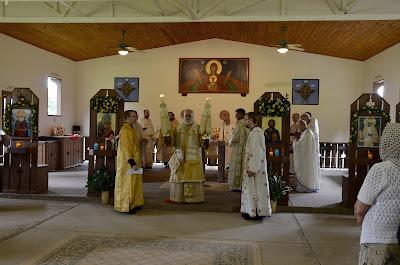 In addition to Archbishops Nathaniel and Benjamin and Bishop Paul, His Grace, Bishop Irinej of the Serbian Orthodox Diocese of Eastern America concelebrated, while Archbishop Melchisedek was in attendance at the festal Liturgy. Concelebrating clergy from the OCA and other jurisdictions also served. Liturgical responses were sung by the monastery choir, directed by Mother Seraphima, and a male choir directed by Seminarian Zachariah Mandell. Bishop Paul offered the homily after the Gospel, in which he encouraged the faithful to carry the cross God has given them as a way to Transfiguration. The traditional Blessing of Fruit was celebrated after the Liturgy. At the conclusion of his post-Liturgy remarks, Metropolitan Tikhon awarded the Order of Saint Innocent, Silver Class, to Mother Christophora “for over 30 years of faithful and humble service to Jesus Christ as the Abbess of the Holy Monastery of the Transfiguration and for offering, together with the sisters of the community, a living example of prayer, hospitality, and monastic obedience to the Orthodox Church in America through integrity of life, sactificial service and liturgical beauty.” He further commented on the role and burdens, as well as the joys and consolations, faced by monastic superiors. Mother Christophora then introduced three invited speakers who have supported the monastery since its establishment. Sam Teolis—Mayor of Ellwood City when the foundress, Mother Alexandra chose to locate the monastery on a 96 acre property four miles from the town center—recalled meeting her for the first time when she deplaned at the Pittsburgh airport, after which he drove her to see the property. He explained that she had chosen the acreage because the land and surrounding hills reminded her so much of her beloved Romanian homeland. Attorney John Regule, the monastery’s lawyer and legal advisor since it was established, offered remarks on the monastery’s history and its legal incorporation in 1967. He recalled how persons from all jurisdictions were enrolled to serve on the Board of Trustees and local planning committee. He also reflected on the condition of the property that, at the time of purchase, had no facilities other than an old log cabin, subsequently replaced by a trailer to house Mother Alexandra and early residents. He concluded by extolling the work of Mother Benedicta and Mother Christophora, who served as the monastery’s second and third abbesses respectively. Finally, Archbishop Nathaniel—a young priest monk when the monastery was founded—recalled the accomplishments of the three abbesses: Mother Alexandra, who was especially known for her talented handwork, Mother Benedicta, who saw to the further organization of the monastic community, and Mother Christophora, whom he thanked for her many years of dedicated service. He also thanked the Sisterhood for electing someone capable of filling the difficult role of Abbess, before acknowledging the oldest member of the community, Mother Elizabeth, for her service to the monastery since 1980. Mother Christophora concluded her remarks by thanking the sisterhood for their very earnest, dedicated and dependable service to the monastery, without which “nothing would be here—neither buildings, nor liturgical services, nor hospitality—without their labors.” Following the festal services, hundreds of pilgrims enjoyed a complimentary catered luncheon and spent time in the monastery gift shop, where copies Mother Alexandra’s autobiography, I Live Again, were available. The pilgrimage drew to a close after the celebration of the Mystery of Holy Unction by Bishop Paul and seven priests. 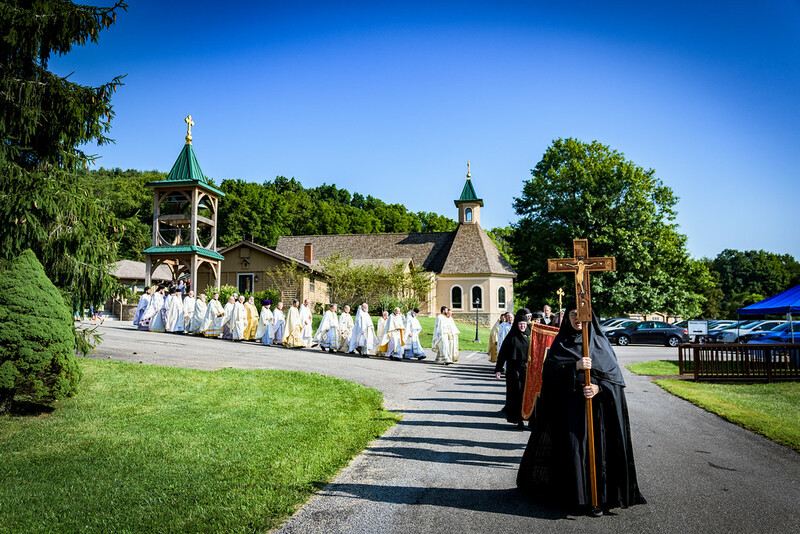 Videos of pilgrimage services may be viewed on the monastery’s website. For printable copies of this schedule for your parish, click on the schedule below. Also included in the file is a printable page for the September Anniversary event as well. Clergy who wish to serve should arrive by 9am to vest for the procession and greeting of the Metropolitan. Thank you to Victor Lutes for the beautiful photos.